This is one of my favorite submissions! Libraries that own this were probably waiting until 2010 to weed it. Some concepts in this book are actually not far off of the truth: ordering groceries and dinner through a computer, video phones, and showers with multiple heads. The pictures are just awful, though. 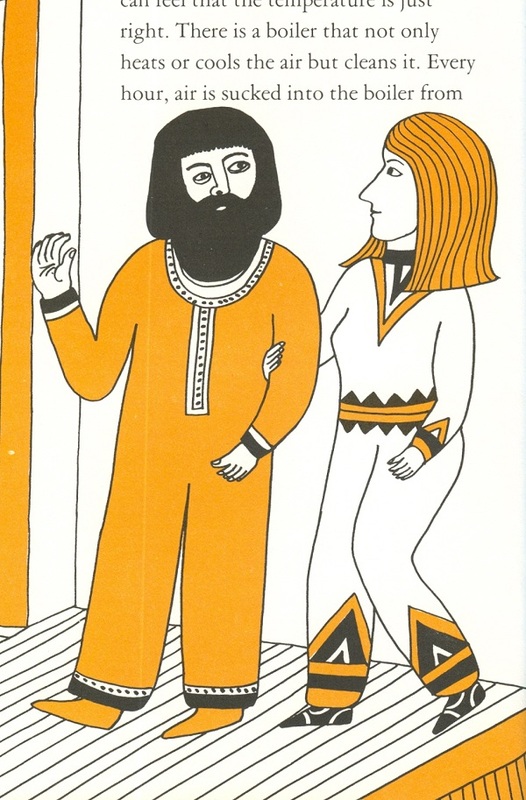 The people all look angry, they’re wearing weird one-piece jumpsuit numbers, and everything is very cartoon-ish. Ok, you can keep it until the end of 2010, but then it goes!! 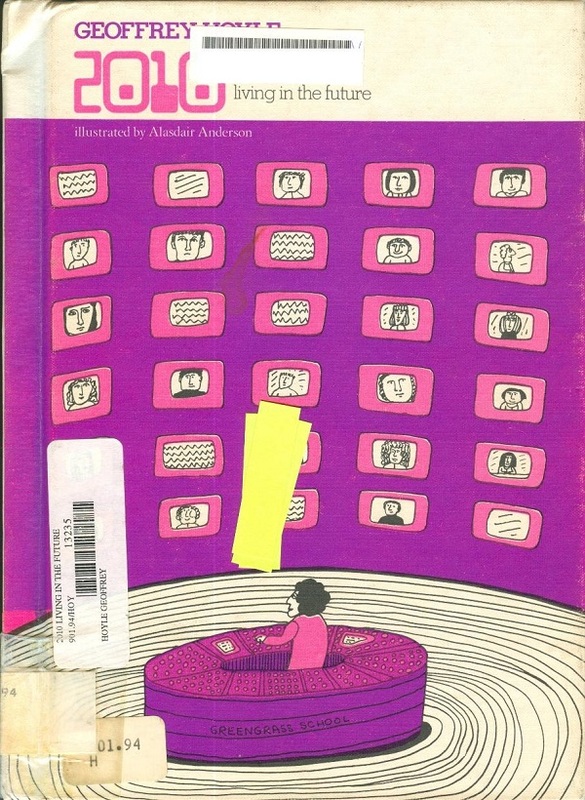 Well, the groovy cover picture has a couple of things right: we are surrounded by computers, videos, and security cameras at all times, and we are apparently swirling rapidly down the drain. As for the internal illustration, it may be intended to depict time travel to Biblical days. Clearly that’s either Joseph & Potiphar’s wife or Samson & Delilah. 😀 Samson is stylin’ in his Yanni jumpsuit! The whole book is fondly remembered on a Tumblr here. If this copy needs a home etc. The dude in the second picture looks like Moses. He does look a little miffed about something. It’s a very Egyptian look. Right down to the strangely flattened human forms. 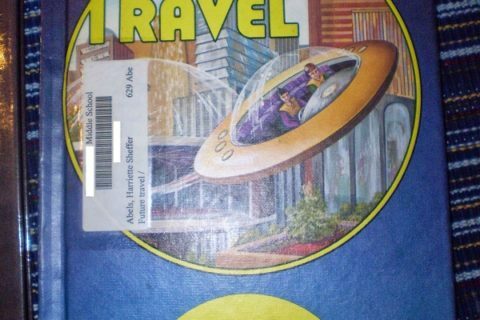 You missed the blogging of this book earlier this year that included the tracking down of the author. I thought this would be fun to own, but Amazon marketplace has only one and it’s $599! We have this book, it has been very popular this year. Cracks me up too much to get rid of it yet. Again, this is another great one for a computer history museum library that wants to explore what people thought computers would be able to do. I am sad that we don’t have the hover cars, but at least we dodged the Everyone-in-jumpsuits bullet. That figured very largely in futuristic visions! I think you can thank McDonald’s for that. No one wants to see the people of the Supersize Generation in a jumpsuit. Wasn’t it Blackwell who predicted that everything was going unisex? You are right about dodging a bullet! It ricocheted off the fitness craze and came out as sweats and hoodies! I didn’t know he was ever lost. 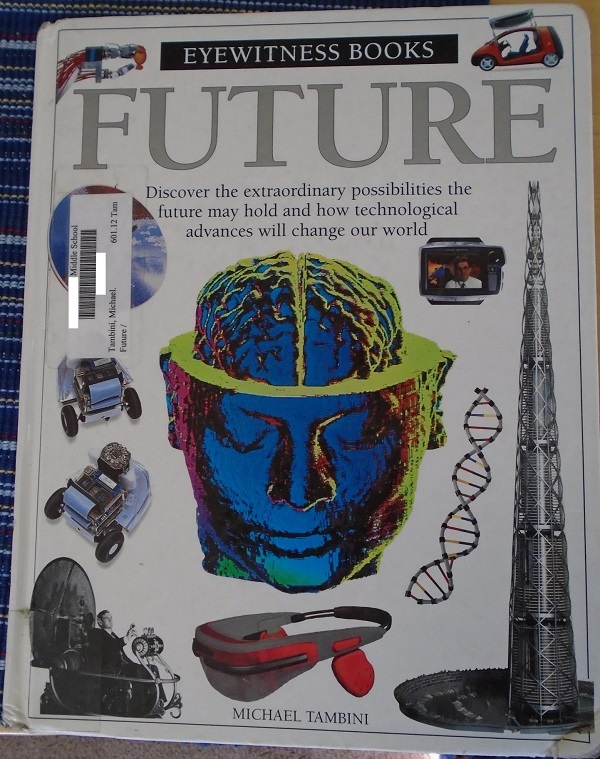 No need to weed it really – it should go straight from the “futurism” into the “history” shelves. I’d be pretty angry too if I had to wear the one piece jumpsuits. What a hoot! It’s obvious the writer is a man. Also, he exhibits the commonest downfall of Utopia inventors: making everybody dress alike. What’s wrong with them all being portrayed as “all angry looking”……I’d say that’s not to far from the truth. Everyone’s angry nowadays. Judging by that last picture, the author of this book mistakenly thought George Harrison would still be alive. This book is being reprinted! I just got it in to review for our magazine!